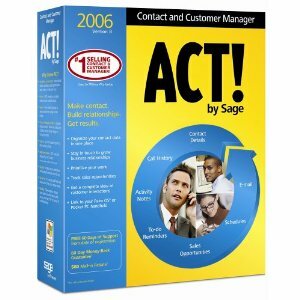 ACT!, from Sage, has been known as the software program for contact and customer information management. The new ACT! 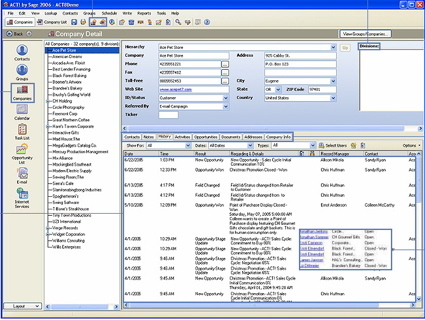 2006 builds on its past successes of providing a central customer database to track contact details, notes, history, appointments, to-do lists, documents, and new opportunities, and adds more features and better integration with Microsoft Office, Lotus notes, and handheld devices. With all your contact information in one place you can more easily track key customer data. Each customer record includes over 60 pre-defined fields, including Name, Company, Phone, Address, Website, Email, Last Meeting Date, ID/Status, and other customizable fields depending on your specific needs. When you create company records you can view a compiled history with notes and opportunities related to each contact at that company. The Groups feature lets you communicate and schedule with related contacts. The notes and other entries you create can be customized using Rich Text Formatting (FTF) so you can add color, links, bullets, graphics, and more. You can also customize layouts by changing colors, adding logos and moving fields so that each record displays the most important information to you in a way that's clear to you. One of ACT! 's greatest strengths is its ability to help you stay in touch with growing business relationships. With it you can track customer correspondences and view a history of all communications with that company or organization. Act! also supplies pre-formatted templates for emails, letters, memos and faxes so that you don't need to fuss with the details or start from scratch each time. Perform a mail merge by selecting a group of contacts to send one email or letter, and a history of the correspondence is then automatically generated for each contact. If you choose, you can use the ACT! E-mail Client to create, send and track e-mail, or use your existing client, as ACT! has seamless integration with Outlook, Outlook Express and Lotus Notes. Prioritize your day to stay on top of appointments and tasks. ACT! helps you prioritize work so that you never lose out on opportunities or forget to follow up with a contact. With ACT! you can easily schedule calls, meetings, and to-dos, or filter these actions by priority, date range, or user. The calendar can be viewed by day, week or month, giving you specific actions for each day or a broader view to plan out an entire month. If you mouse over any activity in the calendar, you'll see a pop-up window with an "at-a-glance" view. Additionally, Activity Alarms will help you stay on top of action items, and incomplete activities will roll over to the next day until they are checked off. ACT! and Outlook calendars can even be synchronized so that you can still schedule appointments with those who don't use ACT!. ACT! doesn't just let you plan for today: you can also use it to forecast for tomorrow. The built-in Sales Process helps you track sales opportunities, and you can view all opportunities at once or filter by specified criteria. The Product List lets you track products or service names, along with item number, cost, and price, and you can generate quotes for sales opportunities without having to re-enter information. There are over 20 pre-formatted Sales Reports, or you can export reports to Microsoft Excel for further data analysis. Those on the go will appreciate the ability to synchronize the ACT! 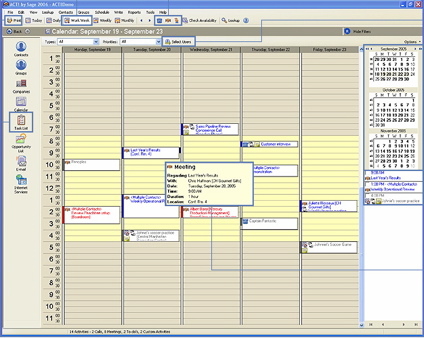 calendar, contact list, to-do information, notes, and history items with Palm OS or Pocket PC devices. Or if you prefer paper organizers you can print to more than 20 of the most popular organizer formats. When out of the office, you can access critical information via Citrix or Terminal Services. 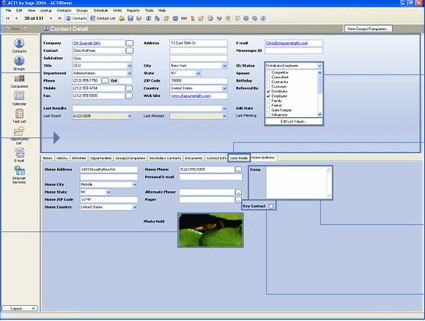 Enhance your database for more accurate reporting.